FAQ: Will the New GRE be Adaptive? Okay, in this video I'm going to talk about something that's actually very important, because a lot of people have misinformation. The new GRE is a test that is section adaptive. That means depending on how you do on your first verbal section will determine which follow up section you get. So if you do well on your first Math section, than your second Math section is going to look very different from someone who did very poorly on the first math section. That is, the test is section adaptive. So everyone starts with the medium section. That first section will not be easy. It will not be hard. It will be medium. That doesn't mean that there will only be medium questions in there, there will be a smattering of both easy and hard, but overall the section is medium. Based again on your performance on the section will determine your second section. So the second section. You can either have an easy section, medium section, or a difficult section. It all depends again, on how you did on the first medium section. What the new GRE is not, is it is not question-adaptive. What do I mean by that? Well let me tell you why people would actually think in the first place that it's question adaptive. Because the old GRE was So, you're sitting down to take a test, the old GRE. It's on a computer, and for each question if you answer it right or if you answer it wrong, it determines the next question you get. So if you continue answering questions correctly, question by question the test will keep getting harder and harder, and that's very different from the current GRE, which is section-adaptive, so your section, once you start off in the medium section, even if you get the first fifteen questions wrong in the verbal section, it doesn't mean that sixteen and seventeen are going to be really easy. It's fixed; it's fossilized, that medium section. It's only when you go into your next section, the second section, that your performance again determines which of these sections you'll get. To get a perfect score you will need to go on to the difficult section. You can still get a very good score if you go on to the medium section and get all of those questions right, so it's important to note that as well of course if you go on to the easy section, either math or verbal, it does constrain or put a ceiling on your score. 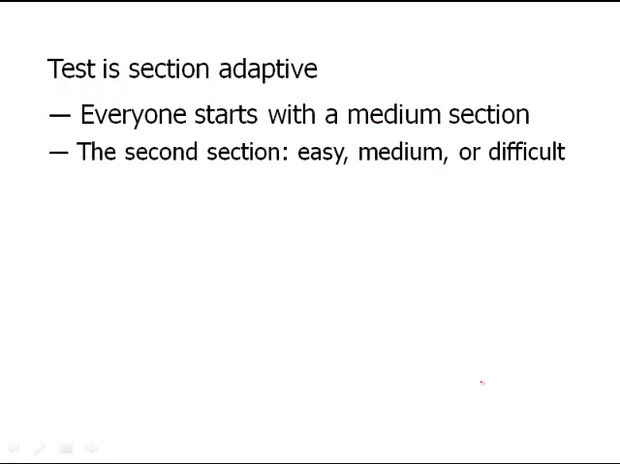 Again the point of this video is to show you that the test is section-adaptive , and it is not question-adaptive. So if you go online and you're reading some website that tells you it is question-adaptive, that website, well, they never bothered updating for the new GRE which changed in August 2011. Here you have it. The new GRE is section adaptive.